In the early twentieth century, infectious diseases were a leading cause of death worldwide. Through the following years, morbidity and mortality caused by infectious diseases decreased considerably in the developed world, but not in the developing world, where infectious diseases remain an important reason for concern. For example, leishmaniosis has become into a serious Third World problem. This is mainly due to an increasing frequency of drug-resistance in Leishmania and an enhanced risk of co-infection with HIV. Drug-resistance is usually associated with an increased expression of specific P-glycoproteins involved in membrane transport. The present review summarizes information which shows that drug-resistance is also associated with changes in physiological events such as parasite infectivity, incorporation of metabolites, xenobiotics conjugation and traffic, intracellular metabolism, host-parasite interaction, parasite cell shape and promastigote-amastigote differentiation. Furthermore, these events may change in a coordinated manner. An understanding of these physiological events may be helpful for designing chemotherapeutic approaches to multiple cellular targets, identifying strategies to circumvent Leishmania drug-resistance and succesfully treating leishmaniosis. Infection by Leishmania gives rise to a variety of clinical manifestations classically labelled as visceral, cutaneous and mucocutaneous leishmaniosis, and chemotherapy is the usual therapeutic approach against this disease . In order to interfere with the normal development of an intracellular parasite, a drug must reach the compartment where the parasite lives; death of the parasite then occurs, either directly or through various cell-killing mechanisms triggered by the active drug in the host cell. The complex life cycle of Leishmania and the intracellular nature of some of its developmental stages make such a task more difficult. Furthermore, as some species of Leishmania migrate to various tissues, they can be associated with all types of leishmanial diseases . The antimoniates, which are the clinical drugs most frequently employed against leishmaniosis, have been in use since the 1920's. However, antimoniates have a narrow therapeutic window due to their toxicity, and there are additional conditions which permit the persistence of Leishmania in the vertebrate host. In fact, the World Health Organization (WHO)  has pointed out that the incidence of leishmaniosis has increased since the 1980's, and that leishmaniosis has gained a relevant position worldwide among the causes of death by infectious diseases. This may be due at least partly to the following facts: a) the risk of co-infection with HIV and parasites causing visceral leishmaniosis is increasing at a high rate , b) sub-optimal doses of the drugs employed may induce drug-resistance, and c) lack of response of Leishmania to various drugs occurs with high and increasing frequency [4–6]. The emergence of drug-resistant Leishmania and the increasing spread of naturally drug-resistant species stress the importance of identifying the mechanisms directly involved in drug-resistance, as well as the physiological changes that may occur in Leishmania as a consequence of, or concomitantly with, the development of drug-resistance. Such physiological changes, whether or not related to drug-resistance mechanisms, contribute to the overall characteristics of the drug-resistant phenotype, and new chemotherapeutic strategies against leishmaniosis could be devised if a comprehensive understanding of drug-resistance were obtained. The significance and relevance of these physiological changes are the main subject of the present review. For the sake of completeness, the genes associated with drug-resistance in Leishmania are also reviewed. 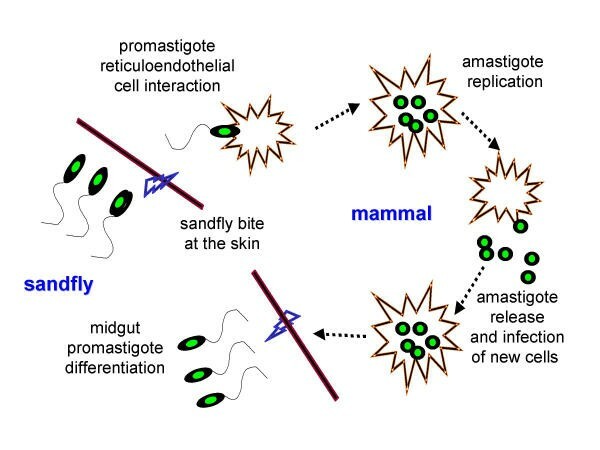 All Leishmania species are morphologically similar and display two main developmental stages through their life cycle: the amastigote, that resides inside the reticuloendothelial cells of the vertebrate host, and the promastigote, that replicates in the gut of a phlebotomine sandfly [3, 7]. The life cycle can be considered to begin when the vertebrate host is bitten by an infected insect (see Fig. 1). High densities of infectant parasites block the cardial valve at the digestive tract of the sandfly and, as the insect swallows the blood from the host, it expels the valve's content, including the parasites. The insect's saliva contains chemical factors that potentiate the parasite infective power and exert a chemotactic effect upon reticuloendothelial cells, which are attracted to the place of innoculation. The parasites are then phagocyted by reticuloendothelial cells, and this fosters their reproduction and survival. For dermotropic Leishmania species the lesion remains in the skin, but for viscerotropic Leishmania the parasite spreads from the initial skin lesion into liver, spleen and bone marrow. The parasites profusely replicate inside the reticuloendothelial cells and eventually burst free from the infected macrophages, spreading the disease within the mammal host (Fig. 1). It is still not clear whether the host cells are actively involved in this event, are physically disrupted by the infection, or undergo apoptosis [8, 9]. As a new insect bites an infected vertebrate host, it swallows infected macrophages, and the parasites differentiate into promastigotes, migrate into the midgut, become metacyclic (infective parasites) during the next four to seven days, and migrate to the cardial valve ready to be re-inoculated into a vertebrate host. The Leishmania life cycle. The Leishmania life cycle begins when the vertebrate host is bitten by the infected insect. Then the inoculated parasites are phagocyted by the reticuloendothelial cells, the intracellular parasites replicate, and eventually burst free from the infected macrophages, spreading the disease within the mammal host. As a new insect bites an infected vertebrate host, it swallows infected macrophages, the parasites are then released, differentiate into promastigotes, migrate into the midgut, become metacyclic (infective parasites) during the next four to seven days and migrate to the cardial valve ready to be re-inoculated into a vertebrate host. Physical and chemical differences among the hosts where Leishmania lives impose radically different stress conditions that must be circumvented by the parasite's ability to adapt to diverse environments. In fact, during the development of the promastigote stage, its transformation into the metacyclic promastigote, its interaction with the host cell and the establishment of the infection, the parasite is continually activating physiological responses which guarantee its survival. There are presently insufficient studies on how the development of drug-resistance interacts with the physiological events that trigger and regulate the parasite's differentiation through its life cycle. The amastigote is the cellular form relevant for human disease (Fig. 1), but pure amastigotes are difficult to obtain in sufficient number for research. It is possible, however to take advantage of the physiological equivalence between the so-called "axenic amastigotes" and lesion-derived amastigotes . Axenic amastigotes have been successfully obtained by exposing promastigotes in vitro to extreme temperature and pH . Their transformation into amastigote-like parasites is concomitant with cellular changes that include the expression of specific stage proteins on their surface [10, 12, 13]. As already mentioned, chemotherapy constitutes the main tool for the control of leishmaniosis, but it is usually slow, expensive and toxic. The available antileishmanial drugs, such as sodium stibogluconate, contain pentavalent antimony, act upon the amastigote and, in order to be effective, should be administered over 20 or more days either intravenously, for both visceral and cutaneous leishmaniosis, or intralesionally in cutaneous leishmaniosis . The antimoniates were empirically developed more than 80 years ago and their mechanism of action has remained elusive. When these drugs are ineffective, or cannot be prescribed, treatment with amphotericin B, pentamidine or paramomycin is indicated. In general, all present forms of treatment show unsatisfactory features, hence the importance of developing inexpensive, effective and rapid therapies both for visceral and for cutaneous leishmaniosis. For example miltefosine, an inhibitor of sterol biosynthesis, has been recently approved as the first oral drug for visceral leishmaniosis in India. It yields cure rates of about 98 %, has negligible side effects and is used successfully to treat cases resistant to antimoniates . Unfortunately, Leishmania can develop resistance to miltefosine, at least in vitro . In general, resistance is defined as a decline in the efficacy of a drug against a population of parasites previously susceptible to that compound. This definition assumes that the original susceptibility of the population is known, which is not always the case for Leishmania. Indeed, resistance of Leishmania against a given drug may be either natural, or may be acquired when the parasites are exposed to sub-optimal drug doses . Resistant phenotypes selected in vitro are usually obtained by culturing wild-type parasites under stepwise increasing drug concentrations. The wild-type parasites may be either heterogeneous (non-cloned) parasites or isolated cloned colonies with high genetic homogeneity. It is possible, particularly in non-cloned colonies, that unexpected phenotypic characteristics are expressed by the majority of parasites. Care must of course be taken not to adscribe such characteristics to a subsequently developed drug-resistance. As in the case of tumor cells, drug-resistance in Leishmania has been frequently associated with decreased cellular accumulation of the drugs. Several hypotheses for decreased drug accumulation in resistant parasites have been proposed, including one analogous to the drug efflux pump model of drug-resistant tumor cells. The increased expression of a conserved type of protein called P-glycoprotein (P-gp) has been one of the most consistent changes detected in drug-resistant tumor cells . P-gp belongs to the ABC transporter family, a designation associated with the existence of a highly conserved intracellular domain that specifically binds ATP . Besides its role in drug efflux, P-gp has been implicated in the elimination of compounds from the cell plasma membrane, steroid hormone secretion, phospholipid distribution, and ATP transport . Over-expression of P-gp occurs as a result of chemotherapy but, since P-gp has been found in normal cells, its physiological and pathological significance is as interesting as the question of whether and how it can be targeted to improve therapy . Although multidrug-resistant (MDR) cell lines which do not express P-gp have been isolated, the expression of P-gp and the efflux of drugs against a concentration gradient usually increase in sensitive cells transfected with mouse or human P-gp cDNA . Alternatively, an altered membrane partition model for decreased drug accumulation in drug-resistant cells has become popular . This model suggests that decreased drug accumulation is the result of alterations in pH gradients, electrical membrane potential and perhaps other biophysical parameters, and is not necessarily a direct result of drug trafficking . As will be presented in the following paragraphs, the use of gene technology has yielded findings related to gene mutation, translocation and amplification which are relevant for Leishmania drug-resistance. Table 1 presents a summary of the genes associated with drug-resistance in Leishmania. As will be discussed immediately, several of these genes are related to transport molecules in the plasma membrane. The first MDR gene homologue discovered in Leishmania, ltpgpA, was an extra chromosomal circle (H-circle) amplified in a methotrexate-resistant L. tarentolae promastigote cell line [23, 24]. Since then, a group of genes belonging to the P-gp gene family and whose gene products confer low levels of resistance to vinblastine, arsenite and trivalent antimoniates have been characterized in L. tarentolae and L. major [25–27]. These genes are also amplified in cell lines resistant to terbinafine and primaquine . The structural conformation of their gene products is similar to that of other P-gp genes, with two hemiproteins, each with six membrane segments, 22 % homology to the human mdr1 gene product and high levels of homology with the multidrug associated protein (MRP) . Transfection of ltpgpA into sensitive parasites triggers an increase in the levels of polyamines and trypanothione and a decrease in the accumulation of pentostam [30–33]. The protein products of these genes play important roles as intracellular metal-thiol-transporter ATPases in the early steps of resistance . In other studies, L. tarentolae promastigotes stepwise selected for resistance to sodium stibogluconate, and mutants resistant to antimony-containing drugs and cross-resistant to arsenite, showed amplification of a locus without significant homology to sequences previously described . Recently, in methotrexate-resistant L. tarentolae a deletion of folic acid transporters has also been demonstrated . A gene related to P-gp in Leishmania is mdr1; its expression is frequently increased in cells with the MDR-phenotype, a result confirmed by transfection experiments in L. enrietti . L. tropica resistant to daunomycin over-express, as an extra chromosomal circular location, an MDR-like gene, ltmdr1, thus implicated in the decreased accumulation of the drug in resistant parasites . In L. amazonensis the longest open reading frame of the lamdr1 gene encodes a protein consisting of two similar halves, each containing six putative transmembrane domains and one ATP-binding domain. These two halves are 91 and 78% identical, respectively, to the closely related ldmdr1 in L. donovani and lemdr1 in L. enriettii . Transfection of lamdr1 to wild-type parasites conferred a significant level of resistance to vinblastine, doxorubicin, and actinomycin-D. This drug specificity of lamdr1 overlaps with, but is distinct from, that of ldmdr1, thus suggesting a functional diversity of mdr1-derived proteins among different Leishmania species. In L. donovani, selection and isolation under the pressure of tubericidin led to the characterization of a resistant cell line which showed impaired drug transport through the plasma membrane . Since tubericidin enters the cell through nucleoside transporters, point mutations in strategic transporter sites were suggested . Other studies have also shown that vinblastine-resistant L. donovani displays cross-resistance to puromycin and anthracyclines and shows amplification of DNA fragments homologous to the mammalian MDR . It has also been found that methotrexate-resistant L. donovani is deficient in folate-methotrexate transporters . Pentamidine drug-resistance has been shown to be linked to a decreased accumulation of this compound, accompanied by a decreased transport of structurally unrelated molecules such as pyrimidine nucleotide as well as by alterations of the polyamine levels . A DNA fragment which hybridized to ltpgpA and showed size polymorphism between the sensitive and the resistant strain was amplified  in L. mexicana made resistant to glibenclamide – a general blocker of ABC transporters including P-gp from different drug-resistant cell lines . This amplification correlates with increased expression of a 185 kDa protein band in the resistant strain, faintly expressed in the sensitive strain , that was recognized by the antibody (F4) against the N-terminal of P-gp. The availability of gene transfection technology in Leishmania originated from studies related to the amplification of the dihydrofolate reductase gene (dhfr-ts) in methotrexate-resistant parasites as well as to the design and creation of shuttle vectors for stable transfection and expression of foreign DNA in these parasites [48, 49]. The use of shuttle vectors has yielded findings that are relevant for Leishmania drug-resistance. These findings may be related to drug transport phenomena, as presented in the previous paragraphs, or may be unrelated to drug transport but nevertheless relevant for Leishmania drug-resistance, as will be presented forthwith. For example, L. mexicana made resistant to tunicamycin, a drug that selectively inhibits the enzyme N-acetylglucosamine-1-phosphate transferase (NAGT), has been shown to express higher copy numbers of an extracellular 63 kilobase (Kb) circular amplicon . By means of DNA fragment transfection, a 15 Kb clone was described to confer tunicamycin-resistance to wild-type L. amazonensis . The minimal 4.6 Kb region necessary to confer tunicamycin resistance was shown to code for NAGT, and the different transfectants overproduced a NAGT transcript of identical size . As a consequence of methotrexate resistance, L. tarentolae preferentially shows amplification of the H locus (ltpgpA) and the pterin reductase gene (ptr1); in L. tarentolae made mutant for the H locus there is amplification of the dihydrofolate reductase-thymidylate synthase, or R locus . Furthermore, transfection experiments using shuttle vectors with ptr1 at the R locus and dhfr-ts at the H locus have shown that ptr1 gave higher levels of methotrexate resistance than dhfr-ts, and that ptr1 was invariably amplified -when present- while dhfr-ts was only amplified when ptr1 was inactivated . These experiments demonstrated that both the locus and the gene determine the frequency of gene amplification in Leishmania. In L. donovani resistance to mycophenolic acid, a potent inhibitor of the inosine monophosphate dehydrogenase (IMPDH), is associated with the amplification of a stable linear extrachromosomal DNA (280 Kb in size) that codes for the IMPDH gene . This extrachromosomal element was subjected to large-sized deletions of its central region and the resulting size-reduced DNA elements were cloned into vectors. These vectors were transfected into mycophenolic acid-resistant Leishmania cells. The mitotic stability of the mutated DNA elements was then analysed over 140 days in drug-free cultures. The largest deletions (DNA fragments of 120 and 200 Kb) altered the mitotic stability and led to a progressive loss of the size-reduced DNA elements. A 30 Kb region common to both deletions was considered as involved in mitotic stability and associated to stable drug-resistance in Leishmania. However, sequence analysis did not show elements typical of centromeric DNA, thus suggesting that the mitotic stability of the DNA element was not associated to the presence of a centromere . Finally, proteomics has been used to identify and analyse an overexpression of PTR1 in methotrexate-resistant L. major . This constitutes the first proteomic analysis of drug-resistance in a parasite and also the clearest identification of a primary drug-resistance mechanism by means of this approach . As will be presented herein, there are cellular events that occur along with Leishmania drug-resistance that include changes in xenobiotics conjugation and traffic, cytoskeleton phosphorylation, membrane microviscosity and composition, metacyclogenesis and infectivity, and mitochondrial gene expression. It is still unclear whether these events are central to the expression of drug-resistance or rather constitute epiphenomena not directly related to drug-resistance. Also unclear is whether these events depend on the amastigote itself or are instead related to the expression of drug-resistance within the patient. Nevertheless, a comprehensive understanding of these physiological characteristics of drug-resistant Leishmania seems fundamental for the treatment and control of leishmaniosis. Resistant species of L. tarentolae accumulate less arsenite than wild-type cells and yet in vitro experiments have shown no difference in the rate of arsenite accumulation in everted plasma membrane-enriched vesicles prepared from wild-type or from arsenite-resistant cells . In resistant promastigotes, however, there is an increased synthesis of the substrate for the transporters as well as of trypanothione, the thiol involved in the arsenical conjugation and extrusion [30, 32, 33]. This suggests that increased synthesis of the substrate rather than an increased number of membrane transporters might constitute a different and novel mechanism of drug-resistance. This also suggests that arsenite-resistance might be mediated by a multigen mechanism which involves ltpgpA, the enzyme gamma-glutamylcysteine synthetase (GSH) at the rate limiting step of glutathione biosynthesis , and a transporter which actively extrudes As (III) glutathione . Such a multigen mechanism of drug-resistance has also been observed in vinblastine-resistant Leishmania [37, 42, 58]. In an arsenite-resistant L. donovani, the level of α tubulin expression is similar between wild-type and resistant promastigotes selected from non-cloned parasites. Differentiation into axenic amastigotes caused differences in the levels of tubulin expression between the two strains . More interestingly, α and β tubulin phosphorylation was highly increased in the resistant strain . It is well known that microtubules (and tubulin) play important roles in leishmanial proliferation, cell shape and differentiation , and the aforementioned results suggest that the expression of drug-resistance could alter either the tubulin proteins themselves or the events leading to cytoskeletal changes that occur during parasite differentiation. As the two strains expressed different sensitivities to paclitaxel -a drug that promotes tubulin assembly-, these results suggest that changes in the expression of structural genes and in the signal transduction cascades might be related to drug sensitivity [60, 61]. In L. donovani promastigotes resistant to amphotericin-B a decreased influx and an increased efflux of the drug, as well as a lower membrane microviscosity, have been demonstrated . Notably, the prevalent lipids in resistant L. donovani cell plasma membrane were saturated fatty acids and an ergosterol precursor, cholesta-5,7,24-trien-3 β-ol, instead of the ergosterol normally found in wild-type parasites. On the other hand, in terbinafine-resistant L. major an increased expression of ergosterol biosynthetic intermediates was demonstrated . Finally, in pentamidine-resistant L. amazonensis alterations in membrane fluidity, lipid content and loss of pentamidine binding sites have been described . These results suggest that an altered membrane fluidity and changes in the extracellular exposure of receptor molecules may be relevant for drug sensitivity in resistant parasites [62–64]. Results presented by Sereno and Lemesre  indicate that no difference in the in vitro infectivity for resident mouse macrophages is observed between wild-type and pentamidine-resistant clones, but decreased in vivo and in vitro infectivity has been described in drug-resistant L. donovani , L. guyanensis  and L. mexicana amazonensis [47, 67]. Decreased lectin-induced parasite agglutination is associated with a decreased infectivity, at least in L. guyanensis , as well as with a decreased expression of the L. mexicana meta-1 protein, indicative of metacyclogenesis in L. major  (Silva, N., Camacho, N., Figarella, K and Ponte-Sucre, A., in preparation). In this context, the activity of acid phosphatase, an enzyme which has been described as a virulence marker in Leishmania , decreased significantly in resistant L. mexicana . Also, there are alterations in lipophosphoglycan expression in pentamidine-resistant parasites  as well as an altered pattern of serine residue phosphorylation in L. mexicana resistant to ABC transporter blockers . Altogether these results suggest that the development of drug-resistance in Leishmania might involve alterations in its differentiation into metacyclic infective parasites. In pentamidine-resistant parasites a modification of mitochondrial membrane potential has been demonstrated . Also, a point mutation in the mitochondrial apocytochrome b (Cyb) gene has been associated to antimycin-A resistance in L. tarentolae . However, in L. mexicana amazonensis there were no significant differences in respiration rate and cellular ATP content between arsenite-resistant and wild-type cells . These result suggest that the mitochondrial genome might mutate as a consequence of drug pressure but respiration and ATP seem not to be prime events associated with drug-resistance. The emergence of drug-resistance represents one of the most serious problems in the control of infectious diseases. Treatment failure in kala-azar, mucosal leishmaniosis and some forms of cutaneous leishmaniosis, occurring in 50–70 % of the patients , is becoming a common problem in many endemic areas. In some cases, this could be attributed to altered drug pharmacokinetics, reinfection, or immunologic compromise of the host. However, there are now strong indicators which suggest that it may be partly due to drug-resistance . Results summarized in the present review show that the overexpression of membrane-bound ATP binding cassette proteins is linked to drug-resistance in Leishmania. These transport systems modulate the efflux or intracellular trafficking of chemotherapeutic agents. Furthermore, the development of drug-resistance includes alteration of other biochemical and physiological parameters. As summarized in Fig. 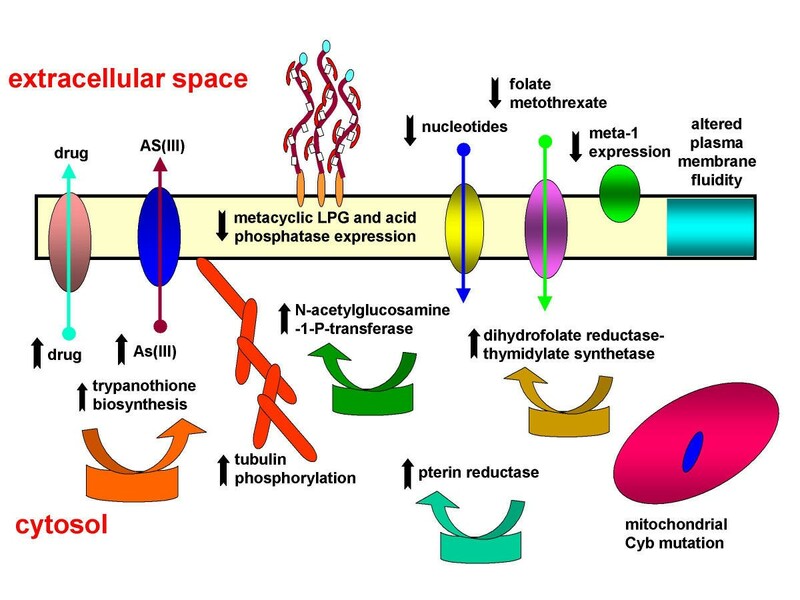 2, mechanisms described so far involve fundamental physiological functions such as drug transport (MDR and MRP), parasite's infectivity (lipophosphoglycan, acid phosphatase and meta-1 expression), incorporation of metabolites considered to be fundamental for the parasite survival (folates and nucleosides), xenobiotics conjugation and traffic (trypanothione and Cyb expression), intracellular metabolism (dihydrofolate reductase-thymidylate synthetase, N-acetylglucosamine-1-transferase and pterin transferase), host-parasite interaction (membrane fluidity and lectin agglutination) and parasite cell shape and promastigote-amastigote differentiation (tubulin phosphorylation). More interestingly, mechanisms other than the frequent amplification of transport systems mediated by MDR or MRP are preferentially linked; this is the case of the pterin transferase gene and the dihydrofolate reductase-thymidylate synthetase complex in methotrexate-resistant parasites, or the gamma-glutamylcysteine synthetase enzyme and a transporter which actively extrudes As (III) glutathione in arsenite-resistant parasites. Physiological events associated with drug-resistance in Leishmania . The physiological events associated with drug-resistance in Leishmania include changes in P-gp expression, parasite infectivity (lipophosphoglycan, acid phosphatase and meta-1 expression), incorporation of metabolites fundamental for the parasite survival (folates and nucleosides), xenobiotics conjugation and extrusion (trypanothione and Cyb expression), intracellular metabolism (dihydrofolate reductase-thymidylate synthetase, N-acetylglucosamine-1-transferase and pterin transferase), host-parasite interaction (membrane fluidity) and parasite cell shape and promastigote-amastigote differentiation (tubulin phosphorylation). Black arrows indicate whether a given parameter is increased or decreased in the resistant parasite. These data highlight the large effort that has been invested in understanding the changes associated with drug-resistance in Leishmania, but questions still unanswered are whether these physiological events a) are central to the expression of drug-resistance, b) constitute epiphenomena not directly related to drug-resistance, c) are expresed by cloned promastigotes before being selected, d) are expressed by the amastigote and therefore affect the intracellular survival of the parasite, and e) are related to the expression of drug-resistance within the patient. Nevertheless, it is hoped that knowledge of such variety of physiological mechanisms will be translated into a more effective treatment and control of leishmaniosis. The author's work has been partly supported by CDCH-UCV, CONICIT and FONACIT, in Venezuela, and by Humboldt Foundation, DAAD and DFG, in Germany.